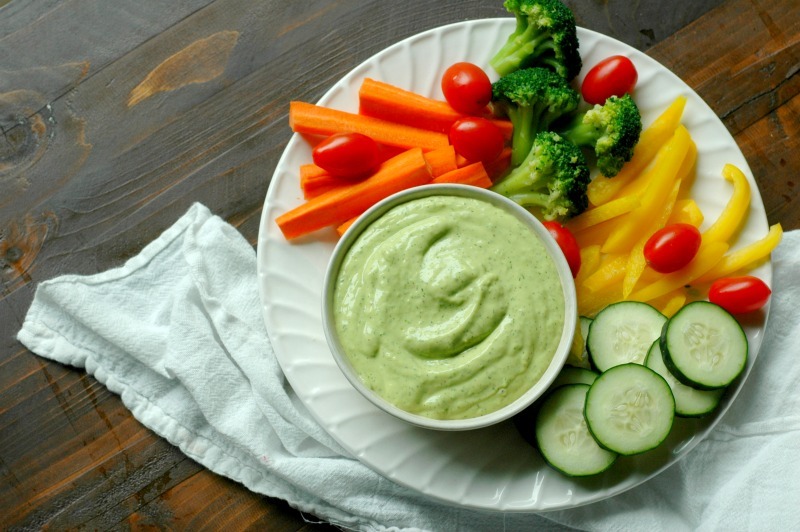 From salad dressing to dip and everything in between, Paleo Ranch dressing is everything you love about Ranch, without the dairy! It’s a bit like my 6 year old and toads…they just go hand in hand! 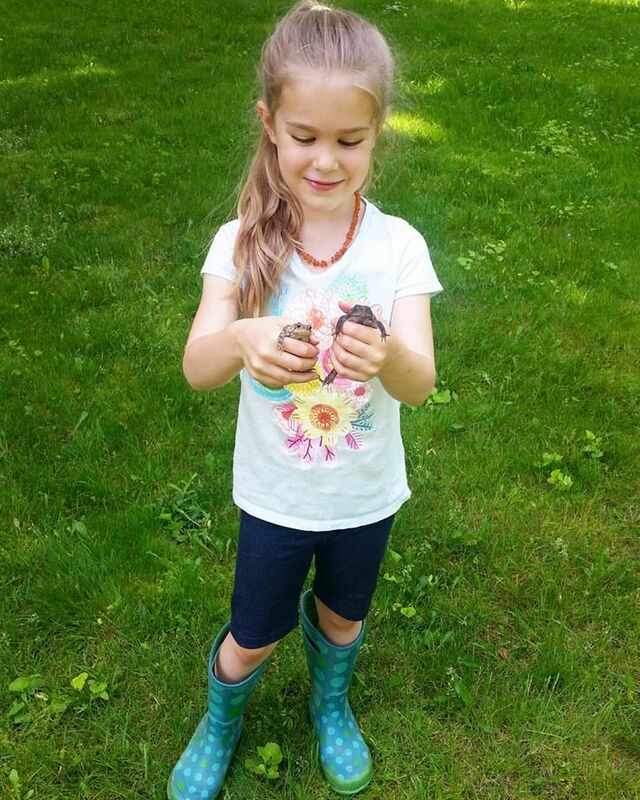 We’ve been enjoying all the creatures that summertime brings…especially this little one who I am pretty sure is destined to be some sort of animal scientist! But back to the kids and Ranch! I don’t remember using many other dressings as a kid, and I don’t know too many kids who don’t love Ranch dressing! 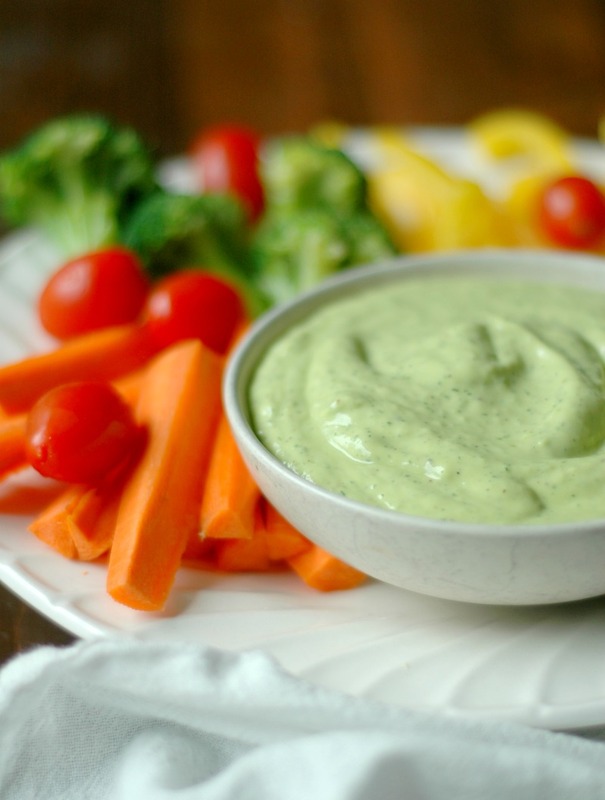 As the commercials usually show, most kids will gobble up just about any vegetable if there’s Ranch involved! 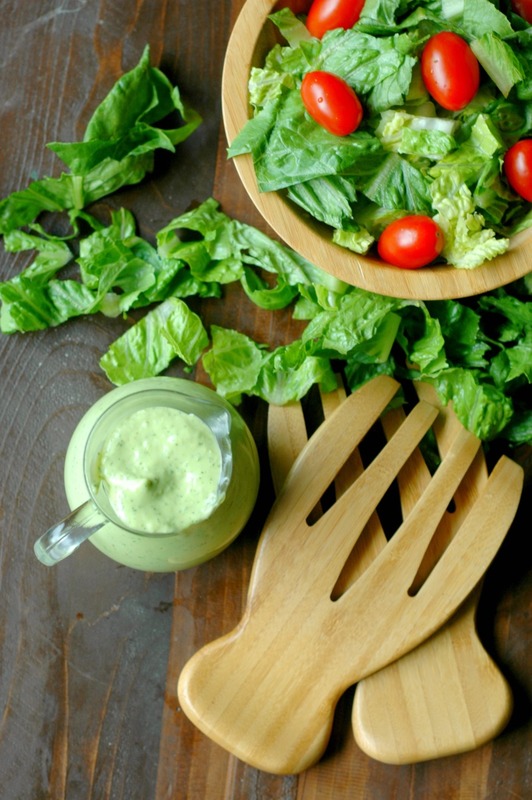 So what’s the problem with commercial Ranch dressings? Store bought Ranch dressings (yes, even many with “healthy” claimed on the bottle), are filled with rancid vegetable oils, soy, preservatives, sugar, and other additives. Kinda ruins the idea of the kids loading up on mineral rich, healthy veggies when they are drowning in it all that doesn’t it?! It’s truly just not worth it. We have generations of kids (including my generation) that grew up on these toxic, rancid fats that did our bodies zero favors. Everything from our brains, to organ function, and even hormone regulation relies on real, healthy fats to work right. All the flavor, using real ingredients! Real food is so delicious dear friends! Big box companies just have to bottle up that flavor somehow faster and cheaper, as well as make it last long on the shelf. Which is why they have to add so much junk to it! The good news, is that when you stick to the basics, and make it yourself, not only does it take just minutes to make, the real flavor from everything from the onion-y scallions to the herb-y dill and parsley give that dressing the Ranch flavor without even having to work hard! I’m talking literally 5 minutes to dump it all in a jar and blend it up. It is easy and fast enough to prep on your prep day every week – if it will last that long. 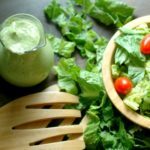 This dip/dressing goes really fast in my house – I swear the girls would drink it out of the jar if they could, and they definitely lick the bowl clean! I’ll be the first one in the room to raise my hand when asked if raw dairy is a good food source. 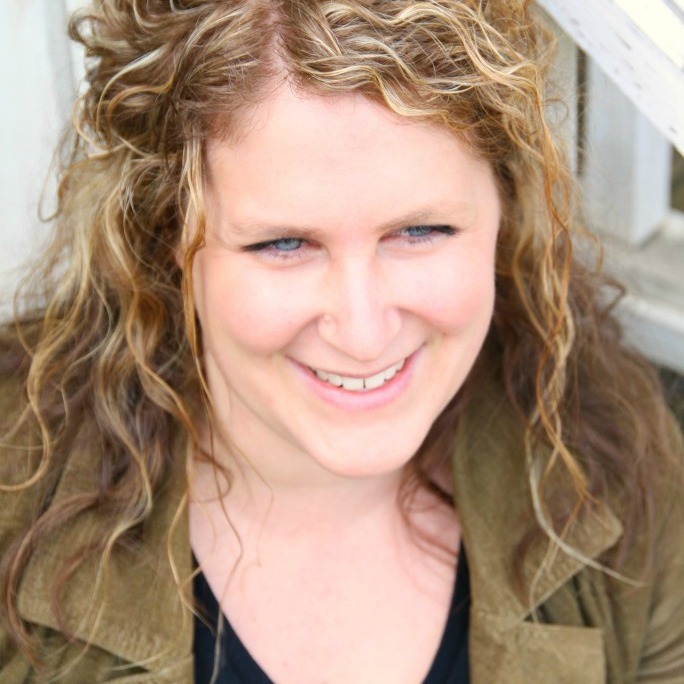 I am a huge believer in the power of raw dairy – and I love our local raw dairy farmers! Sadly, I just don’t tolerate it. So while it is a very healthy food, it just doesn’t work for some people, and that’s where I come in! You can swap the coconut milk for raw milk or cream easy peasy if you tolerate dairy and wish to! And my dear dairy free friends, I hope you enjoy this creamy dreamy Ranch – I promise you won’t taste the coconut! Pinky swear! This time of year, my herb garden is loaded to the brim with herbs to make Ranch. In the winter we swap to dried herbs a lot (simply figure cutting the amounts of the fresh herbs down to a couple teaspoons of dried to make the swap). 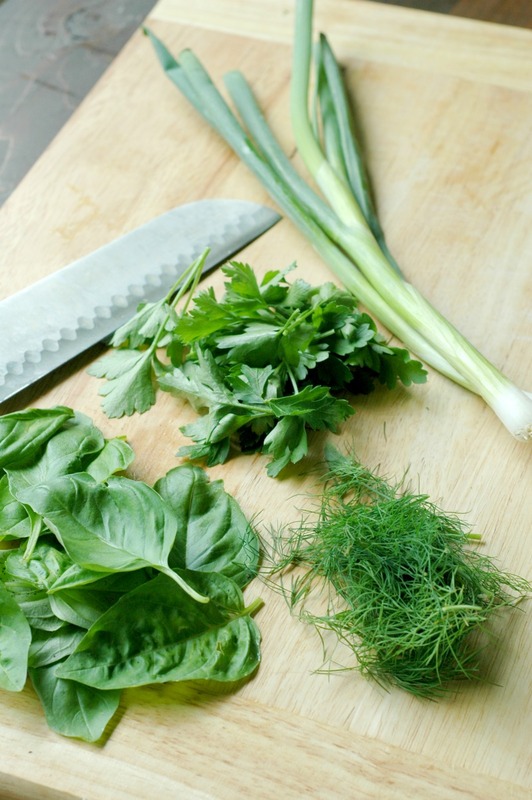 I do think that fresh herbs just make the Ranch that much sweeter…it really just takes the flavor up a few notches. If you have access to fresh, do it! Different ways to flavor your Ranch! Change things up a little big with these really fun ways to flavor your Ranch for a fun dip or dressing. My kids to tend to prefer just the plain Ranch, but 2 of them really love the Asian dressing mixed with a slaw salad – don’t knock it til you try it! Asian Style Ranch (so good on a cabbage slaw salad!) :: Swap the avocado oil for sesame oil. Swap the parsley for 1/2 tsp or more of ground ginger to your taste. Swap the white wine vinegar for 2 tbsp coconut aminos (tastes like soy sauce without the soy). It is easiest to make this dressing in a quart sized jar. The recipe makes a little over a pint of dressing. The quart jar just gives you more room to get all the fresh herbs in there, as well as use the blender. And speaking of the blender…the immersion blender will become your most beloved kitchen tool if you have never tried one before! Put it on your wishlist – you won’t be sorry. It gets daily use in my kitchen from dressings to soups! 1/4 cup avocado oil Olive oil would work too. Everything into a quart mason jar (I just measure the liquids using the measurements right on the jar instead of dirtying measuring cups!). 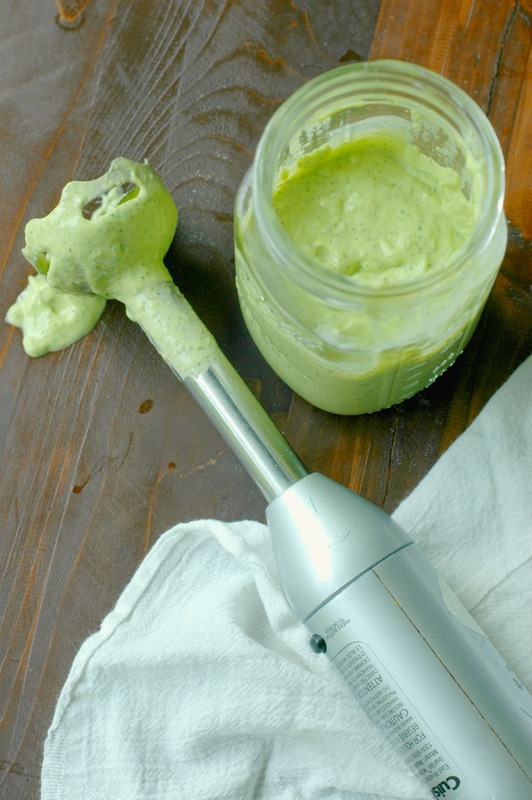 Use an immersion blender to blend until smooth. Taste for salt/pepper to your taste. I cannot wait to make some of this! It sounds delicious and I love all of the healthy fats in this. Tiny Love is going to love this as a dip too. Gorgeous recipe!!! It would spruce up any old boring salad or veggies, for sure. Such a pretty color. My husband is OBSESSED with ranch, so I’m always looking for paleo ranch recipes. I will definitely try this! 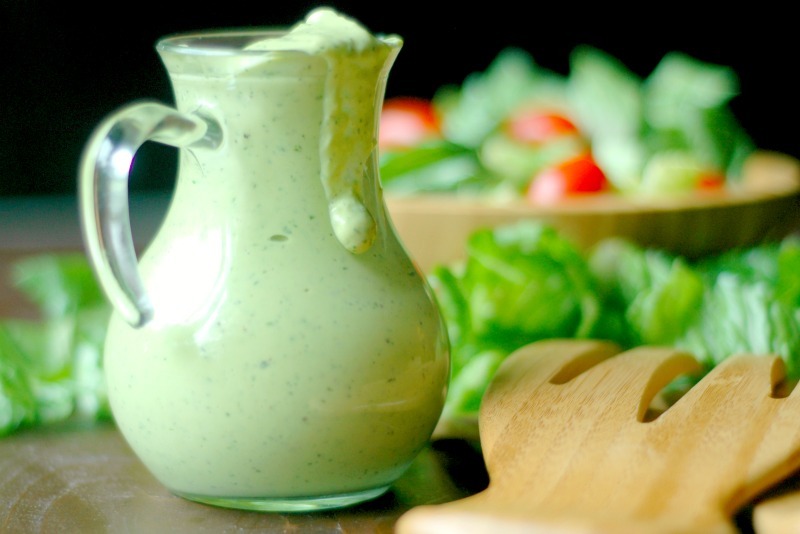 Ranch is my favorite dressing – this looks like it would taste awesomesauce! Oh man, I love you. I actually was about to make a ranch dressing tonight and realized I wasn’t sure how to make it dairy-free. So now I know and I’ll just make it tomorrow instead!! Looks SOOO good! Ah! Great! I hope you enjoyed it! 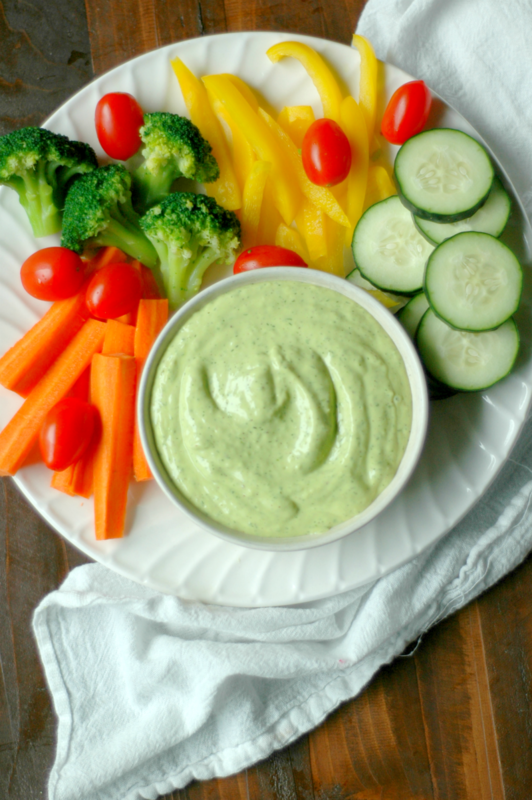 This looks like the ultimate Ranch Dressing, you just can’t beat veggies dipped in ranch – I’ve been addicted to it my whole life! Love this ranch dressing. It’s so creamy and dairy-free. Awesome !! This sounds great, I love all the fresh herbs. It’s so AIP friendly too!!! Great recipe. Wow, Ranch that is egg and dairy free! That is magical! That immersion blender is one powerful tool. I love it to whip up easy dressings like this ranch dressing. Love that gorgeous green hue to it. Ranch dressing is not a term I’m familiar with in the UK, and I personally avoid dressings – but this looks superb!!! Great add to any salad. I’ve never liked traditional ranch but your fresh green version looks mighty tempting! 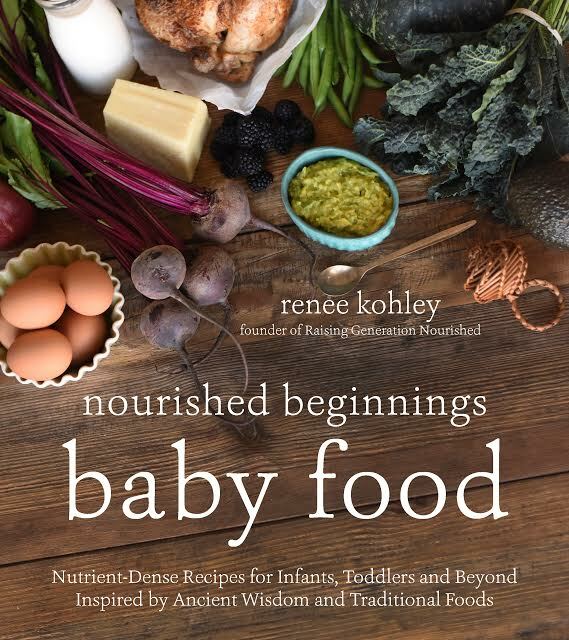 I’m looking forward to making this! My daughter is dairy/egg/gluten free and is allergic to avocados (she requires a low histamine diet). I’m looking for a dip/dressing that doesn’t include avocado. Any ideas? Hi Tamara! Can she have coconut? You can swap the avo for coconut yogurt – although yogurt would probably be considered histamine (fermented) correct? Hmm…I have a French dressing/dip that my kids love but it has some ketchup – tomato are out with histamines too, correct? Let me keep thinking! This looks amazing! I’m trying to go Paleo, but being allergic to eggs is a huge problem when trying to eat that way. Thank you for posting an egg free ranch dressing! I am going to be trying this. 🙂 Can you tell me, how long will this recipe last in the fridge? My son and I are starting the Whole 30 tomorrow. I’m not sure if he will like this or not. I would love to try it, but I’m allergic to coconut. Any suggestions on a Whole 30 compliant substitute? Could you swap out the white wine vinegar for apple cider or white vinegar? Just trying to use what’s already in the pantry! Hi Nikki! White vinegar should be fine, but I would not recommend ACV – it won’t taste good! Where can I find the nutritional value? Hi Martha! You can Google nutritional value calculators – there are a few you can put the ingredients in and grab those values. Could you replace the white wine vinegar with ACV or red wine? Would lemon juice work as well as the vinegar in this recipe? Not able to use vinegars currently due to health issues. Hi Sara! Yes that should be fine! Oh my!!!! We just made this tonight! It is amazing!!! I have been sugar free and dairy free for 10 months. 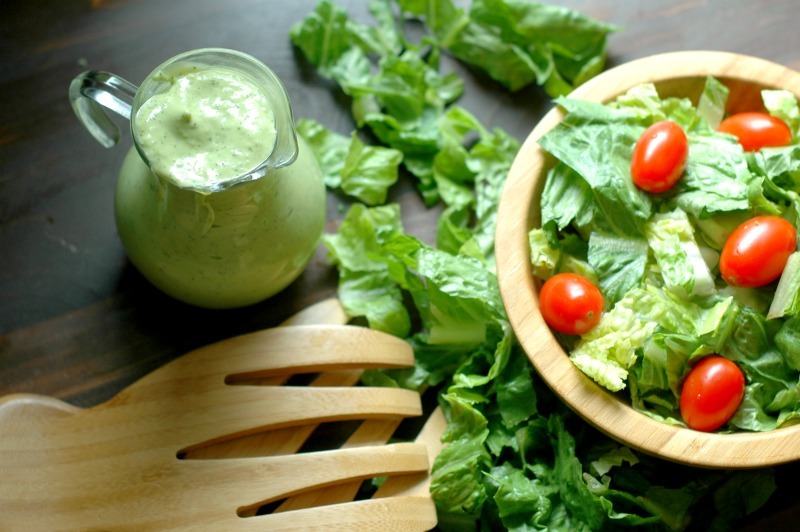 I was missing very little, but I have gotten tired of my homemade vinaigrette dressings. I really missed my ranch dressing. 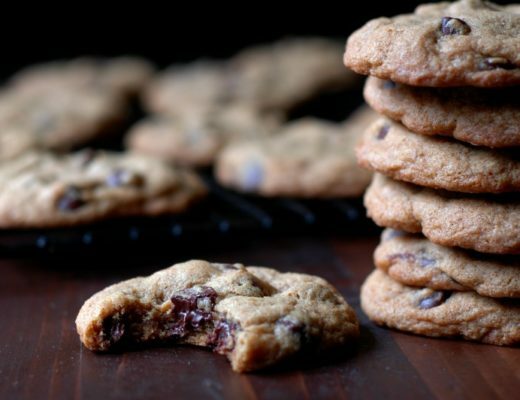 This is better than any store bought recipe I ever had! This is delicious! Mine was a touch heavy on the green onions for my taste so I may cut back to 2 next time. Other than that, I won’t change a thing! Delicious! Thank you!!! Awesome Kimberly! I’m glad you enjoyed it!